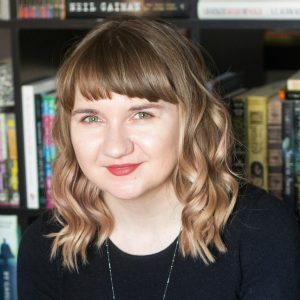 Rebecca Diem is a writer, music lover and nerd. She is the author of the indie steampunk series Tales of the Captain Duke, following the adventures of a defiant young aristocrat who saves a band of airship pirates from certain peril and talks her way into joining their crew. An avid bookworm, Rebecca was honoured to receive a ‘Nose in a Book’ award from her elementary school librarian, and has a dedicated To Be Read shelf in her growing library. Somewhere between reading Virginia Woolf and Neil Gaiman she began to write her own stories, and has no plans to stop. Rebecca now calls Toronto home and is on a never-ending quest to find the perfect café and writing spot.